I thought BeaTunes could do loudness analysis, but I can't find any trace of how it works on the web site. Can someone give me a link? Specifically, when the analysis is done, how can I tell from an mp3 file in iTunes how it was evaluated? 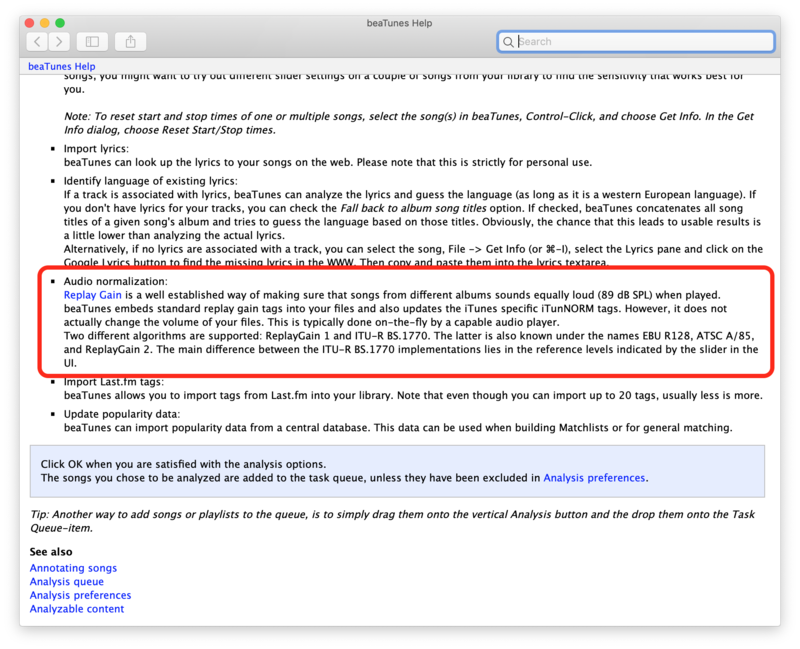 beaTunes can do loudness normalization by adding ReplayGain (and iTunNorm) tags to the file. It does not change the the file in any other way. iTunes does not honor ReplayGain tags, but only iTunNorm tags and only when SoundCheck is on. So the first thing you need to do is turn SoundCheck on in iTunes (preferences -> playback). Then analyze your files using beaTunes for ReplayGain. To see the suggested gain, select a file in iTunes, open its Song Info dialog (⌘I), and go to the File tab. There you should see the gain adjustment in dB in the line volume. Can I send you a track? Somehow the volume is marked as minus 9 db which makes it very soft. It’s not a loud track to begin with. Sure. But what should I do with it? Figure out the bug in your software that makes it lower the volume. Which algorithm and settings did you use? For ReplayGain 1 and standard target level of 89dB SPL, I get a gain of -5.6dB. For ReplayGain 2 with standard target level -18 LUFS, I get -4.78dB, which is in line with what Foobar2000 produces. My guess is that you set a target level that does not fit your expectations. Yes. Once you've started the application it's under the Help menu. Admittedly, this is not 100 pages of prose, but all the basics are covered. Just to illustrate, I have attached a screenshot of the info about ReplayGain. just wanted to check in with you. Is this issue solved? Yes, solved. It looks like the file already had its volume set, and I didn’t check the “replace value” button. Cool. I'll close this discussion then. hendrik closed this discussion on 25 Feb, 2019 01:20 PM.